DEATH CULT Jonestown Memorial trading cards uncut sheet. 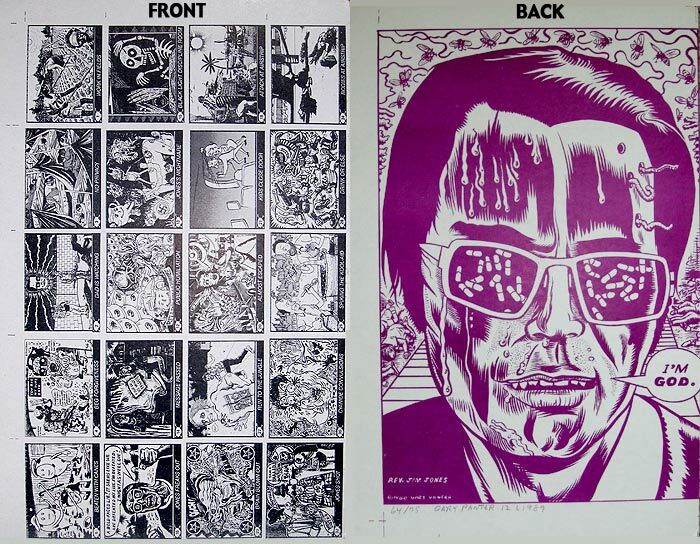 Individual card art by Kaz, A. Mostrom, J.R. Williams, Carol Lay, R.K. Sloane, Jim Blanchard, Mark Mothersbaugh (Devo! ), Savage Pencil, Wayno, The Pizz, and others. Reverse full-size image by Gary Panter; signed, numbered (64/75), and dated (12/6/1989). 11" x 17", black and purple ink on card stock. Buy together with DEATH CULT uncut sheet #2 and get both for just $100, plus shipping. I accept PayPal.